I don’t know about you, but my thoughts are not always noble, right, pure, lovely, admirable, excellent or even praiseworthy. In fact my thoughts can be pretty degrading and about as stinky as blue cheese. I did a 3-day challenge where I wrote down my stinkin’ thinkin’ thoughts and my oh-so-lovely thoughts. When I remembered to write them down, I noticed right off the bat, I had more stinkin’ thinkin’ thoughts. Whew, this was not gonna be easy. Let’s go through one of my days. I woke up, praised God for the day and thanked Him for all my blessings and walked into the bathroom where I took a look in the mirror where I proceeded to make a face at the face staring back at me in the mirror. Check out that awesome bed hair, and is that a new wrinkle or a crease in my face from sleeping so hard? Could my eyes have darker circles than these audacious circles today? Good grief did I beat myself up or is the bottom half of my eye socket falling into my brain? Oh, is that white streak from the toothpaste I used or more likely a nice dried patch of drool? Could I be any more attractive? Ughhh!!! That’s a lot of stinkin’ thinkin’ in less than 60 seconds!! Thankfully, my thoughts didn’t stay focused on myself all day. There were the telemarketers that called that I had less than praiseworthy words for, the folks in the grocery store who seem to think parking their cart in the middle of the aisle is absolute best spot for their cart, and don’t get me started on the people that clear their throats and then spit on the sidewalk. Then there’s the posts on Face book where I wonder….what would possess a person to post their most personal drama for all to witness. See…all stinkin’ thinkin’ thoughts. At the end of the 3 day challenge I wrote 58 stinkin’ thinkin’ thoughts and 23 lovely thoughts. Mind you that was 3 days of about 8 hours and the ones I remembered to write down. 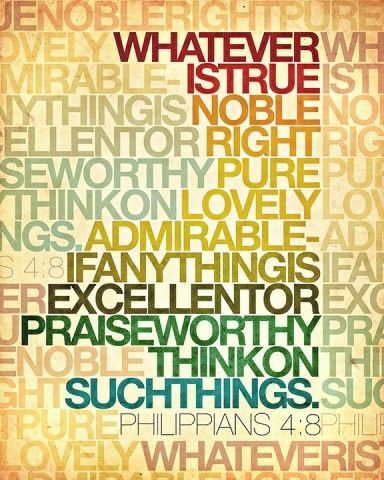 Hmmmm…is it any wonder God says to think about whatever is true, noble, right, pure, lovely, admirable–if anything is excellent or praiseworthy–think about such things? It’s in no way #beneficial for me to stinkin’ think. It doesn’t make me happy, it doesn’t put a smile on my face nor bring joy to my heart. I’m sure if I voiced my stinkin’ thinkin’ thoughts out loud, it wouldn’t make the receiver happy. In fact as I type this, I’m actually scowling. As I reviewed my stinkin’ thinkin’ thoughts, I wondered how I could be so cruel to myself. I would in no way say the things I said about myself to anyone else. In fact the things I thought about myself, I would go out of my way to assure another those things were not true, that there was much more to that person that what they were seeing. And then it hit me. While I am busy beating myself up with my own words, God is telling me I am fearfully and wonderfully made. He’s telling me I am precious in His sight. He’s telling me to stop the stinkin’ thinkin’ and “Finally, brothers and sisters, whatever is true, whatever is noble, whatever is right, whatever is pure, whatever is lovely, whatever is admirable–if anything is excellent or praiseworthy–think about such things.” That right there is some #beneficial soul food that I can fill my mind and spirit with. I know, right Christine? It’s like groundhog day some mornings. Sheesh, Gotta cut ourselves some slack, we’re His creation and He makes no mistakes!! Thanks for stopping by, blessings to you!! Isn’t it wonderful that God tells us we are beautiful, made in His image, worth while. We need to centre our thoughts on good thoughts and know that we are loved no matter what kinda day we are experiencing. Thanks for sharing no good, stinking thoughts. We are beautiful. It is very wonderful that God overrules the stinkin’ thinkin’!!! Thanks for stopping by Marilyn, I appreciate your encouragement 🙂 Blessings to you sister!! Could I love this any more than I do? No! Awesome post sister! Thank you for the reminder to think on the things that are lovely….love you sister! Just amazes me the number of thoughts that go through our head each day and how many are negative!! Sheesh!! Gotta make a shift in where my mind is taking me!! Thank God that His truths overrule any of the stinkin’ thinkin’. Love ya girl!! You are THE BEST!!! 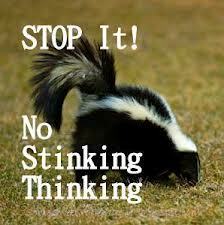 I LOVED the pic of the skunk to further illustrate the “stinkin’ thinkin'” tendencies we all have!!! LOVE LOVE LOVE you, and thanks so much for sharing!!! I’m going to be watching my stinkin thinkin thoughts from know on after reading your post! Your words left me thoughts to ponder and live by. Thanks for sharing! Girl, you know I was!! hahaha Agreed….ewwww to stinkin’ thinkin’!! We are His children and I can only imagine how He must feel, I mean really, could you imagine saying any of the bad mojo jo jo thoughs that we think about ourselves to our kids?!! It would break our hearts!! We need to be kinder to ourselves and appreciate the gift we are and you my friend are an amazing daughter of our Father!! Love you Tara!! I finally got to sit and read this. Trish you crack me up, everything you say is so funny yet so true. You are such a blessing, you totally inspire me with your writing. So real and true, yet so willing to allow Christ to work in it!! !